Google Affiliate Network allow there Account holder to monetize there blog/ website content with the Affiliated ads in form of text link Ads or banner link Ads , by placing those ads and the sales generated by those banner links will be counted towards publisher Earning in form of Commission ,More and more Sales will bring more and more commission , With Google Affiliate Network you can join as many Advertiser you wish to , depending upon advertiser terms and condition for approval . Although its look damn easy to earn money with Affiliated Network like Google Affiliate Network , commission junction etc but its tough for the user who are new to Affiliate marketing as they need to learn lots to generate there first income with Google Affiliate Network . 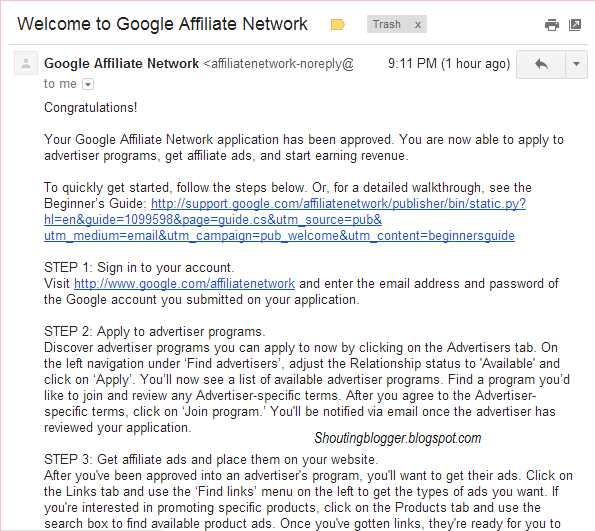 Why join Google Affiliate Network ? Google is the world Biggest and trusted Brand which do pay money for there publisher . Google Affiliate Network Payment thresholds is about 10$ . Wide range of banner and marketing Material with Google Affiliate Network . You must have an Google AdSense account to apply for Google affiliated network as well as receive money. With google adsense Account , A publisher will not get Google affiliated account approved . Steps to Get A Google Affiliate Account . Step 1 : Go to Google AdSence and Sign up for AdSence account www.google.com/AdSense Before applying for Google AdSence account make sure your website fulfill AdSence account requirements to get your AdSence account approval faster . Step 2 : Once you Gets your Google AdSence account approved then Go to Google affiliated network Website at http://www.google.com/ads/affiliatenetwork . Step 3 : Signup as Publisher under http://www.google.com/ads/affiliatenetwork . If you Receive a email as shown Below that Means your Google Affiliate Account has been approved , and you can start showing Affiliated ads on your website .